Sharing my own fascination with ocean and climate issues in many different formats with different target audiences. Expeditionslernen (since 2017). 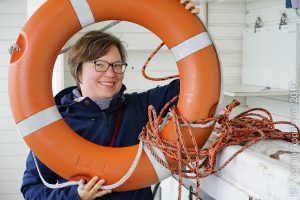 In this four-day course “expedition learning”, 17-year olds learn to observe and classify waves and map wave fields along the Kiel Bight. They then integrate their observations in a GIS-like software and discuss their observations with relations to current weather conditions and extreme events. MeerKlima.de (2017, June). I was invited to speak at this student-organized congress aiming at high school students and conducted a workshop on ocean circulation and the impact on climate. Videos available here. Jugend forscht und Schüler experimentieren (since 2016). Serving as jury person at a national science competition for middle and high-school students. Hamburg, Germany. Science camp Ratzeburg (2015, August). Week-long summer camp for teenagers on combining learning how to sail and experiments. Self-organized, Ratzeburg, Germany. Wind und Meer (2014, August). Week-long summer camp for gifted teenagers, leading the group on physical oceanography (including lectures, experimentation and cruise), Deutschen JuniorAkademie, Bad Bederkesa, Germany. Tank experiments + presentation for a geofag2 class, aged 17, visiting the University of Bergen as part of their career counselling. Introduction to Oceanography (03.2013, Olsvikåsen vidergående skole, Bergen, Norway) Tank experiments + presentation for pupils, aged 15, working on a one-year oceanography project. Three separate presentations and demonstrations of tank experiments to school children, aged 7-10. Apparently, the best predictor for whether or not kids end up choosing STEM subjects is whether or not their parents cook together with them. This might be an urban myth at my work place, but in any case, I believe that it is important to enable parents to share interest and enthusiasm and a scientific approach to things with their kids. Materials I have produced and shared online have been used with permission, for example in an article in Bergens Tidene (E. Darelius and P. Langebroek, 2015, October). I started blogging for personal knowledge management as a way to organize pictures I took of my rainy Saturday “kitchen oceanography”, teaching resources and relevant literature, and the comments and suggestions for improvements my friends made. During my postdoctoral fellowship at the University of Bergen I was presented with the opportunity to teach several courses without supervision and hence with maximum freedom to explore my own teaching style and methods. Born from a personal lack of mentoring opportunities, I became active in several mentoring networks, taking on leadership roles as well as facilitating workshops in addition to mentoring mainly young women. Currently most of my mentees have sought me out outside of formalized relationships and are therefore not explicitly mentioned here. Supervising students at IPN (since 2016). I am a formal mentor or advisor of several students at Leibniz Institute for Science and Mathematics Education at Kiel University, Kiel, Germany. – S. Kellberg (since 2017). PhD thesis on learning about energy in the context of a museum exhibition. – H. Bruhn (since 2017). Master thesis on developing experiments to teach ice-albedo interactions to school kids. – J. Köpke (since 2017). Master thesis on developing experiments to teach the role of the ocean in the climate system to school kids. – J. Fischer (since 2017). Master thesis on developing experiments to teach the role of atmospheric CO2 in the climate system to school kids. – M. Siebert (since 2017). Master thesis on developing experiments to teach about the hydrological cycle to school kids. – P. Michalik-Sobolewski (since 2016). PhD thesis on how much mathematics is needed to understand exhibitions. – D. Hadinek (since 2016). PhD thesis on learning about energy in a high-school context. ESWN Networking mini-workshop (2013, April). Leading sessions on networking for women in the Earth Sciences at the European Geosciences Union’s General Assembly, Vienna, Austria. Female early career workshop – climate/physics (2013, November). Leading a session on how to build your own mentoring network. Bergen, Norway. CyberMentor (2011–2013). Online mentoring of students interested in mathematics, informatics, natural and applied sciences. MentorNet (2010–2013). E-Mentoring Network for Diversity in Engineering and Science, mentoring students online. ESWN international leadership board and ESWN-Europe committee (2010–2014). Leadership roles within the Earth Science Women’s Network. Responsibilities include facilitating networking, writing proposals, planning and conducting workshops. Peer-Mentoring Program (2010–2011). In-person mentoring of PhD students. Integrated School of Ocean Sciences, Kiel, Germany.